If you’re new to diffusing essential oils, I’m certain you must really be wondering just how does an essential oil diffuser work? One of the great things about living in the Internet age is the free flow of home keeping and lifestyle ideas. There’s something to be said for a free exchange of ideas, and never more so when they can lead to the kind of multicultural exchange that is both empowering as well as invigorating. With the influx of different ideas from all corners of the globe and Internet alike, therefore, it should come as no surprise that all-natural oils have seen a sharp rise in popularity. Before the advent of modern science and all of the incredible advances that it has given us, all-natural oils were among the most popular lifestyle and home keeping options explored by different cultures around the Ancient Mediterranean, Middle East, India, and China. From the Pharaohs of Ancient Egypt to the Emperors of the Roman Empire and dynasty after dynasty in China, all-natural oils were a favorite luxury of the rich and powerful around the ancient world. As such, if you’re looking to give your home a bit of Old World flavor and evoke a sense of Roman decadence or perfume it with the sweet scent of Chinese courts, these all-natural oils might be just what you’re looking for. While modern science has largely moved on from that luxury, those looking to introduce a blast from the past into their home keeping routine can find quite a lot to enjoy here. This can be particularly true when it comes to all-natural and essential oil diffusers. Not only do these items effectively disperse the oils in question throughout a given space, but they also function as elegant home accessories in their own right. Even so, the question remains – just how do all-natural and essential oil diffusers work? Let’s be honest, for as popular as these oils and diffusers might be, many of us don’t take the time to actually consider how they work. There is a lot of hype surrounding these oils at the moment, and so separating fact from fiction can be tricky. To that end, here’s a quick look at how all-natural diffusers work, as well as how they can work best in your home. First, let’s take a step back and consider what these oils are and do a bit more broadly. The first thing to say in this regard is that there’s a very good reason to consider them more of a “home keeping” or “lifestyle” brand than hard science. These brands typically situate themselves more as an “alternative lifestyle” choice, and deliberately so. They are typically more concerned with the luxurious, relaxing, classical, and – lest we forget – all-natural ideals they embody. There are plenty of other benefits to these types of diffusers. For one thing, as stated above, they can make for a great accessory for those who are looking to bring a sense of all-natural beauty or ancient style to their home décor. The oils themselves are also typically sweet-smelling, which makes them a great choice to perfume a room. In addition, there is some evidence to suggest that essential and all-natural oils have the capacity to help eliminate unwanted fungus and bacteria. In that sense, therefore, they can have some added usefulness to go with all that luxury. So, just how do they go about doing that? How do these diffusers work? If you’ve ever owned an air purifier, humidifier, or other type of diffuser, you probably already have a general idea. We’ll go into greater detail regarding how different types of diffusers work in a moment, but as a general rule, diffusers tend to work by having the moisturized substance (in this case, the all-natural essential oil oils) contained in one part of the unit while being blown out by a fan located in a different part of the unit. How much is released at one time and the range of the unit can vary, but regardless of all of those different variations, this is the general model for how most diffusers work, including those utilizing essential oils. So, that’s the basics of how diffusers tend to work. As such, let’s go ahead and take a closer look at a few different types of all-natural oil diffuser work. For as much as essential oils tend to position themselves as an “alternative” to modern science, they have no problem utilizing methods that take their cue from scientific terminology. Case in point, ultrasonic essential oil diffusers. These units work by creating “vibrations” within the unit which are supposed to break down the oils contained within into “microparticles,” which are then released as a fine mist via steam and diffused throughout the given area. While you might think that all of those vibrations might make for a noisy unit, the opposite is actually true, as these models are often among the quieter options on the market. If you’re looking for a diffuser for your bedroom, therefore, these options might not be a bad pick. The very name of these types of diffusers pretty much give away how they work – by utilizing heat, of course. But how? Simply put, where ultrasonic units release their oils in a mist, these types of units heat the oils in question until they evaporate into the air. This can be great for diffusing thicker materials, such as sandalwood. These units can generate heat in a variety of ways, from electric means to candlelight, which allows you to choose between a more classically ancient approach or a more modern one. If heating essential oil diffusers already releases their oils by causing them to evaporate into the air, how do evaporative essential oil diffusers distinguish themselves? The simple answer is these units use a fan to blow the evaporated oils into the air. This makes these units a bit more modernized then many of their heating-only counterparts, and thus also often feature a greater range when it comes to the area in which they can effectively disperse the oils you’re using. These types of essential oils are often the best for those who care mostly about the perfuming aspect of all-natural oils. They place a high premium on being able to break down oils in such a way as to concentrate and enhance their aroma once released. 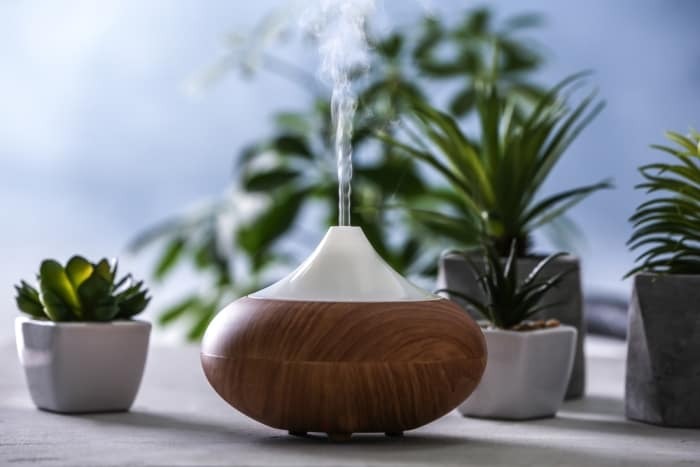 If your main reason for looking into all-natural oils and essential oil diffusers is to keep a space smelling sweet, these might be the right options for you. So, that’s a general breakdown of how your all-natural essential oils diffusers work, as well as a closer look at how some of the most popular types of diffusers out there function. Even so, it’s worth examining at least one more aspect of diffuser functionality – namely, how to go about cleaning your unit. You may think that your diffuser is a lovely little dispenser of all-natural oils, cleansing your home’s air while perfuming whatever room it’s in, but if you’re not careful, that diffuser can become an odiferous magnet for grime and bacteria. This is down to the basic yet oft-overlooked fact that, if you don’t clean a unit, it tends to get dirty, and thus instead of spreading clean, all-natural oil throughout your home, it instead spreads all the dust, bacteria, and other pollutants that have had time to take up residence inside your uncleaned diffuser. Separating the different parts of your diffuser, including your fan, bowl, and any electrical components which might be contained therein. You’ll want to consult the directions to make sure that your unit can be taken apart and that you are doing it the right way. Utilizing vinegar to help clean the bowl in question, thereby cleansing it of contaminants. Utilizing soap and water to clean the bowl again. Lightly going over any other areas that might have collected contaminants. Carefully putting everything back together. Last but not least, it’s worth noting that how essential oil diffusers work is important because it hints at their ultimate role in your home. Knowing how something works and what its limitations are is always a key aspect to making sure that you’re purchasing the right unit for the right reasons. These types of diffusers can be a great way to give a room a lovely aroma. They can be incredibly soothing, especially quieter models. For that reason, they can make for incredibly luxurious items. That said, you’ll want to check into the range offered by different models to make sure that you’re getting one that suits your needs. You should also be aware that while essential oil diffusers may be a great add-on for your home, they should not be used as a substitute for any scientifically-approved treatments by medical personnel. Armed with this information, you can make a free and informed choice as to which all-natural oil diffuser, if any, is right for you.